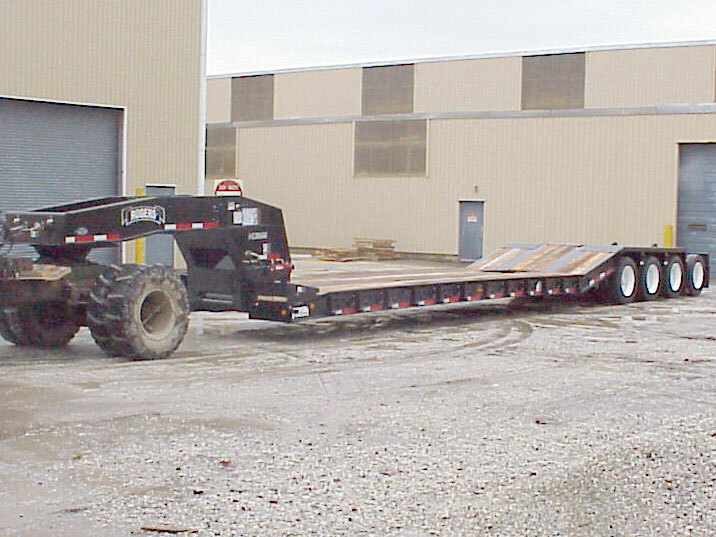 This ROGERS 60-ton capacity trailer features the "Gentle Riser" deck which makes this lowboy ideal for carrying multiple machines. This patented "No Foot"® Tower Style self-lifting gooseneck also has hydraulic trap doors to assist with quick and easy detaching. The last three cross members of the deck have been notched to make a "bucket pocket." It's for an excavator to knuckle under and have more overhead clearance. The "Gentle Riser" – 16° riser slope – enables a machine to be loaded onto the rear frame. This rear frame has customer-specified flush wheel covers over the tri-axle. A removable axle like this is used in U.S. states where a 4th axle is required to carry 60 tons. It has a hand control valve to adjust the air pressure to equalize the overall weight with this axle. The toolbox in the deck can hold chains, blocks and binders when not needed with trailer loads.